Tracking employee overtime is challenging and can ultimately wreak havoc on your bottom line if you don’t stay on top of it. Even worse, if you’re using antiquated tools such as spreadsheets, or paper, you could be making errors that increase your payroll costs and harm employee morale. 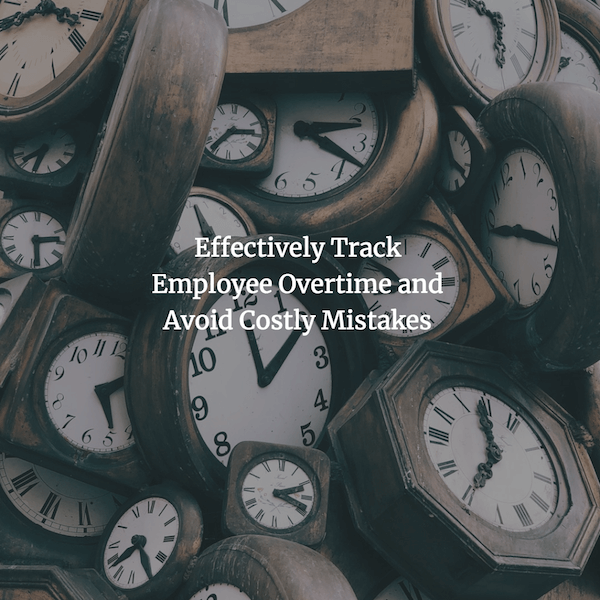 Whether you’re a small company of 25 employees or a larger organization of thousands, avoid the negative surprises when it comes to overtime tracking by implementing a comprehensive, cloud-based Employee Time and Attendance software solution that can handle your overtime recording needs and give you the big picture of how time is being spent and allocated. Sloppy, or non-existent overtime tracking can lead to significant financial losses. In today’s competitive market there are many cost factors a company can’t control, but overtime shouldn’t be one of them. Time and Attendance Software let managers generate real time reports so they’ll know exactly when overtime thresholds are closing in. They’ll be able to make informed decisions regarding resources and overtime and prevent unnecessary employee payroll expenses. Time and Attendance Software is a valuable tool giving managers unprecedented insight into individual employee’s overtime records and putting an end to unauthorized overtime. Now you can easily identify if an employee is consistently claiming overtime hours each week simply to collect extra pay or if the overtime is warranted or due to staffing shortages. With outdated tracking systems, managers often found it easier to simply round up an employee’s timesheet to save time with calculations. Yet rounding up minutes on a regular basis can easily add up over time and end up costing the company. Time and Attendance Software lets you set the parameters that work for you so you can set rounding to 0, 5, 10, 15 or even 30 minutes. You can also specify different rounding rules for punching in and out. Quite simply, Time and Attendance Software significantly reduces the time it takes to perform virtually every aspect of employee overtime tracking. By eliminating manual timesheets and automating processes such as clocking in and out, managers are now free to spend their time on more productive job responsibilities. An effective Time and Attendance solution lets users customize the software to suit the way their company operates. It should feature flexible settings that give users the power to choose the type of overtime setting they need, from weekly, daily or mixed overtime mode and then allow them to specify the number of hours when overtime or double overtime gets paid. This is particularly important when adhering to Country, State or Provincial labor laws. How do you track employee overtime? What difficulties arise in your organization when it comes to tracking overtime? What tools would help with those challenges? We encourage your thoughts on this topic in the comment section below, and if you found this article helpful feel free to share to your networks. For more information on Midex Time Control, check out one of our online demos or sign up for a FREE, no-obligation, 30-day trial.